Owned 44 years by the current owner, a Factory L78 that appears it has led a semi charmed life which has significant ownership history. The body appears to be an unhit body that has never had any major repairs of any type, it displays no signs of rust or rust repair and it appears to have again led a charmed life. Finding a 396 of this caliber is extremely hard they become very rare when you start talking about things like original drive train, unhit body and factory side exhaust. In addittion it carries the original low production transistor voltage regulator, alternator and TI Ignition set up, teak steering wheel, telescopic steering wheel, correct carburetor, air cleaner lid and wing nut just to mention a few of the unique hard to find original pieces on this vehicle. All of these items appear to be original components to this car. In addition many other options were included in this build U69 PB AM/FM Radio, A31 Power Windows, N32 Teakwood Steering Wheel and N36 Telescopic Steering Column, N14 side Mounted Exhaust System and the fairly rare for a 396 3.55 Positraction, This is a very authentic well maintained and preserved 1965 L78 Corvette, confirmed by the original GM issued Trim Tag, VIN Plate, Engine, Transmission and Rear End. There are numerous manufacturing practices that were accounted for and present when analyzing this vehicles production. This is a real Goldwood Yellow Factory L78 396/425hp Coupe optioned with Factory Side Exhaust. The single most significant piece in the collectability of the 65 L78 396/425 Corvette once you can establish the provenance is in my opinion the original engine. 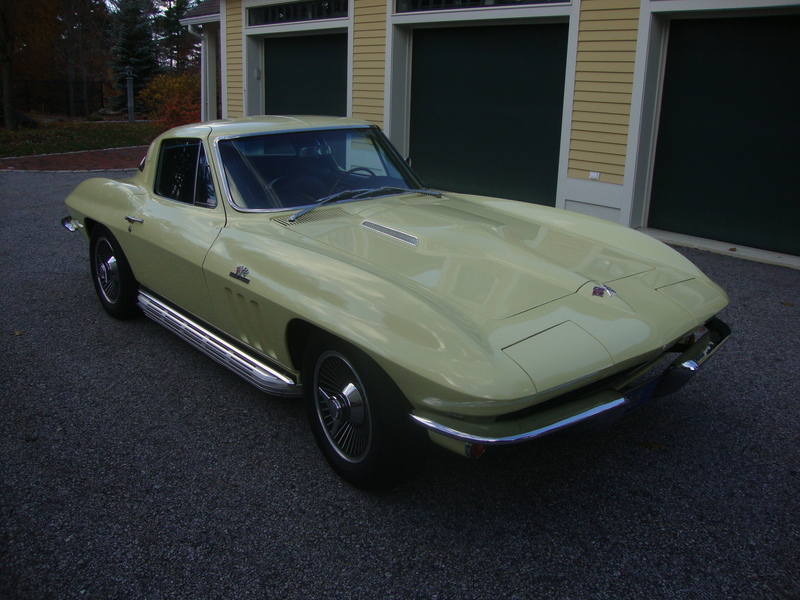 This Corvette has the original engine that it was born with a very typical original early GM/UAW built 396 engine. In addition my inspection of this engine included verification of the correct four bolt machining configuration confirmed by the block machining and engine oil pressure line installation along with the correct 3856208 rectangular port cylinder heads.